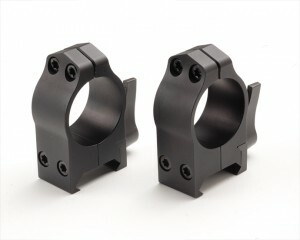 Tactical Solution�s 1� scope rings are precision machined from 6061-T6 aluminum using extremely tight tolerances to ensure perfect grip contact on the scope. Our quick detach system allows the shooter to remove their scope quickly and reattached while maintaining zero. Tru-Tac 1� rings utilize a stainless steel recoil lock which distributes recoil evenly across the slot in the base. Designed to fit cross slot Weaver design as well as Picatinny rails.